← 2014 Moleben for the Unborn has begun! March for Life President Jeanne Monahan addressed concerns that the annual pro-life walk was too heavily Catholic, reaching out to evangelical Protestants. But based on the participation of Eastern Orthodox Christians in this year’s events, marchers may have been forgiven for believing the whole march breathed with the other lung. Every major event, and several minor ones, featured distinguished clergy from the world’s second largest Christian denomination. 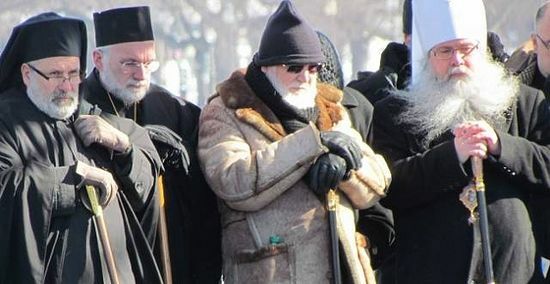 Archpriest John Jillions, the chancellor of the Orthodox Church in America (OCA), represented his church at the “National Memorial for the Preborn and their Mothers and Fathers,” an annual interdenominational prayer service held at Constitution Hall. 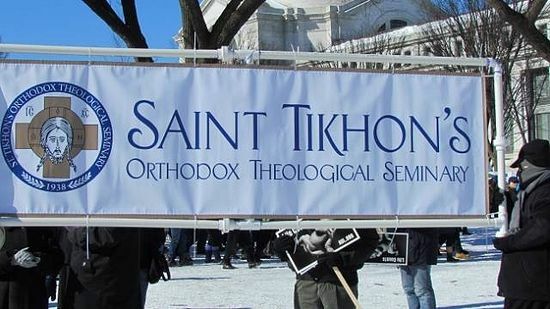 The most visible participation came as Orthodox clergy filled the stage at the March for Life, which began with an invocation given by Bishop Demetrios (Kantzavelos), the Greek Orthodox bishop of Chicago. “Forgive them, Lord, for they know not what they do,” he said. He was joined on stage by the ruling hierarchy of the OCA (Metropolitan Tikhon, Bishop Melchisedek, Bishop Mark, Bishop Michael), as well as representatives of the Romanian Orthodox Church, Antiochian Orthodox Church, Armenian Orthodox Church, Syriac Orthodox Church, and a representative of the U.S. Catholic bishops. Like the rest of the March, the Orthodox delegation heavily featured young people. The nation’s major Orthodox seminaries – St. Vladimir’s Seminary in New York, Holy Cross in Boston, St. Tikhon’sin Pennsylvania, Holy Trinity in New York, and others – sent delegations. He said the Eastern embrace of human life grows out of its key doctrinal belief: that God is love. “It’s not just about shouting and getting hyped up – although it is about making our voice heard – but it’s also about demonstrating God’s love to a cold world,” he said. Bishop Demetrios said the presence of so many young people of all backgrounds gave him hope. Of course, not all participants were young, or new to the event. Dr. David C. Ford, Associate Professor of Church History at St. Tikhon’s, said he has been coming with his students since 1988. “It’s a highlight of the year to be here as a group and standing up for the sanctity, the dignity of all of human life,” he said. He said the highlight for him was the Orthodox prayer service for the unborn. “It’s beyond words how important that is,” he said. Prominent Orthodox clergy and laity joined the annual event, as well. The chancellor of St. Vladimir’s Seminary, Fr. Chad Hatfield, was present. He marched near Fr. John Kowalczyk, a leading voice on the issue and the author of two books on abortion: An Orthodox View of Abortion and Church Fathers and Abortion. Shortly before the pro-life event, the Republican National Committee announced it would postpone its annual winter meeting so delegates could attend the March. RNC Chairman Reince Priebus is Greek Orthodox.